For someone used to the typical CAMRA style of guided tasting, today's Adnams event at the King'sTun in Kingston was quite a change. Instead of a sit-down session with jugs and notes, Adnams business development managers Nigel Chubb and John Lamb took a tray of sample glasses each and worked the room between them, stopping at tables here and there to offer tastings and a chat. Nigel Chubb said they find these movable tastings work really well to push up awareness and sales, and are a lot more practical than sit-down events. They also work as quality checks on the pubs, he noted. Neither he nor John is a brewer, but they both have many years experience in the ale trade and now join forces – the rest of the time they cover adjacent regions – to do a few events like this a week. "We only have the one brewer," making meet-the-brewer events harder to arrange, he said. John Lamb added: "We mostly do the big chains – Wetherspoon, Nicholsons...." He said Wetherspoons is particularly good for Adnams – yes, it expects a large discount for volume, but no more so than any other pubco – and has done a lot of good for the cause of real ale in general. He added that 'Spoons pubs keep their beer very well. Some can turn over a nine in as little as two hours, showing how fresh it can be, he said. 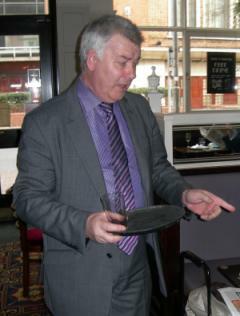 As he came round with a tray of Explorer samples, I asked John how he decides who to approach on a movable tasting. "Normally with this beer I'll be attacking the lager drinkers," he said. "We've had some great successes there." He explained that Explorer (4.3% in cask form) has been through a few changes as head brewer Fergus Fitzgerald worked to give it more body and a more stable flavour. That work has definitely paid off, with a very nice golden ale. It now has three hop varieties rather than two for its citrussy nose, a bit more of a buttered-Digestive-biscuit body from its East Anglian pale malt, plus hints of vanilla and grapefruit in the finish. Sample number two was American style IPA. This was the most popular of last year's "Beers of the world" series which saw Adnams 'visiting' New Zealand, Belgium and elsewhere. At 4.8% in cask, it's a lovely hoppy bitter with what the Americans call a dank aroma – and yes, that's quite different from what us British think of as dank! It's the smell of the hopsack, here laid upon a well-bodied ale: "Our golden equivalent of Broadside," Nigel called it. Speaking of which, sample number three was indeed that well known strong bitter. This time the aroma was of dried fruit and maybe a little muscovado, then on the palate it was that interesting combination of dryness and sweetness, with malt and raisin notes and faint hints of dark honey and oak. I mentioned to John that some publicans have said it can be difficult selling ales around 5% in strength versus those around 4%, but he said this doesn't seem to have affected Broadside (4.7% in cask). It still sells well, and not just in 'Spoons where it is typically the same price as everything else. If you're in the Kingston-upon-Thames area and haven't been to the King's Tun lately, give it a try. The ales are very well kept, and as well as the main Wetherspoons beer festivals, it is starting to run its own "in-pub" festivals – the first one started today, runs to the 26th,, and alongside Adnams it features ales from Loddon, Dark Star and Twickenham. More events are planned for the current festival too, including meet-the-brewer sessions with Loddon (whose Forbury Lion IPA was in excellent form this afternoon) and Twickenham.